Maira, the creative director of the studio, decided to come back to Peru after living abroad for 11 years between New York, London & Paris. With studies from world's most prestigious design schools including Parsons School of Design (New York), Central Saint Martins (London), and L'école de la Chambre Syndicale de la Couture Parisienne (Paris) she created the studio: a unique space designed to create. Located in the heart of Miraflores, in Lima-Perú, the studio is equipped with several workspaces including a design library, a main atelier, a design supply store and design digital lab. A three floor beautiful minimal and welcoming space that without a doubt you will absolutely enjoy. She is in charge of all the creative department from concept development to art direction and together with Vincent, she handles advertising and business strategies. She is an award winning fashion & textile designer with more than 10 years of experience in the fashion industry. She absolutely loves Japan, french bulldogs & cactuses. He handles the finance development of the company. Engineer by profession but business manager by heart, he holds a bachelor's and master's degree in civil engineering from University of Porto (Portugal) and École Nationale des Ponts et Chaussées (France). This French-Portuguese is a huge fan of the Champion's League. He loves crêpes, American hamburgers and sport fishing. Deborah // GRAPHIC DESIGNER SR.
She is in charge of the graphic department. With studies at the Peruvian Institute of Art and Design (IPAD), she has more than 10 years of experience in advertising, illustration, 2D animation, design for social networks and editorial design areas. She loves cats, the Castlevania video game and karaoke. Claudia // GRAPHIC DESIGNER JR.
She works in the Graphic Design area. She studied Art and Graphic Design in Pontifical Catholic University of Peru (PUCP) and did an exchange program in Textile Design at UMPRUM in Prague. She is a yoga teacher as well who loves traveling, working with crafts and learning new things constantly. She is in charge of the Communication area as well as the social media of the Studio. She holds a BA degree in International Relations, that she studied in Mexico, her native country. She loves trekking, all that involves a sustainability way of life and Studio Ghibli movies. He is in charge of the studio's blog, writing articles and news on the fashion world as well as covering art, design and culture topics. He holds a bachelors degree in fashion design from Mod'art Peru. He loves reading, classic cinema and Lasagna. He is in charge of maintaining the accounting and tax services of the studio and together with Vince he assures that all logistics run smoothly. He loves surfing, spending time with the family and his favorite color is green. She is in charge of maintaining all our spaces and making sure everything is looking absolutely great. She is also in charge of setting up our dyeing workspace. She loves learning new techniques and helps Maira in all dyeing services as well as preparing the yarns! 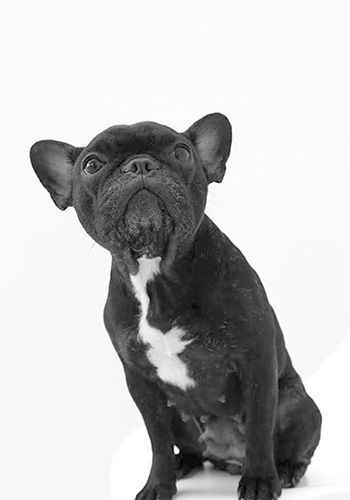 Lola is an adorable French bulldog born in Perú. She loves potatoes and taking sun on the terrace.Without a doubt, she will make your visit to the studio enjoyable. Woof Woof ! © 2018 STUDIO MAIRA JIMENA. All rights reserved.